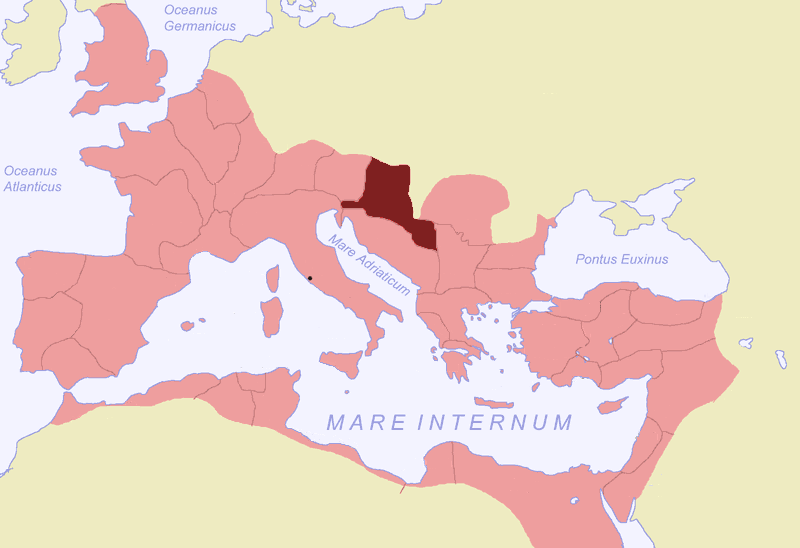 Pannonia was a province of the Roman Empire bordered north and east by the Danube, westward with Noricum and upper Italy, and southward with Dalmatia and upper Moesia. The first inhabitants of this area known to history were the Pannonii (Pannonians), a group of Indo-European tribes akin to Illyrians. From the 4th century BC, it was invaded by various Celtic tribes. Little is heard of Pannonia until 35 BC, when its inhabitants, allies of the Dalmatians, were attacked by Augustus, who conquered and occupied Siscia (Sisak). Some time between the years 102 and 107, between the first and second Dacian wars, Trajan divided the province into Pannonia Superior (West), and Pannonia Inferior (East). According to Ptolemy, these divisions were separated by a line drawn from Arrabona in the north to Servitium in the south; later, the boundary was placed further east. The whole country was sometimes called the Pannonias (Pannoniae). (41) Constantine I 324-325 A.D.
(42) Constantine I 307-337 A.D.
(61) Constantius Gallus 351-354 A.D.
(64) Constantius I 305-306 A.D.
(69) Constantius II 324-361 A.D.
(70) Constantius II 347-348 A.D.
(101) Julian II 355-361 A.D.
(135) Valentinian I 367-375 A.D.
(136) Valentinian I 367-375 A.D.
(137) Valentinian I 364-375 A.D.